Join Tommie Macon & the Gentlemen of Jazz on the stairs of the Virginia-Highland Church (743 Virginia Ave NE) for a free concert. Also featuring Sweet Auburn BBQ‘s food truck, Face Painting, Inman Middle School’s Jazz Combo, and an Artisan Food Market. 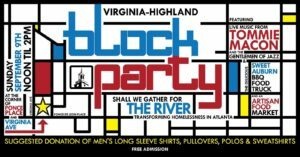 The Virginia-Highland Block Party is in support of The River – Transforming Homelessness In Atlanta. Admission is free. There is a suggested donation of men’s long sleeve shirts, pullovers, polos, and sweatshirts.